Well, at least that is how it felt! After a bit of a sleep-in this morning (till almost 8:30!) The Captain and I enjoyed a leisurely breakfast and a then after a bit of a wait, we headed out for a run. I decided that we should go late morning so that we could just have lunch after our stretch instead of having a protein drink and delaying lunch a couple of more hours. It is a gorgeous day here on the Island... blue skies and the temperature is about 18C right now which translates to just under 70F... perfect for running along the Strait. And I must admit to loving seeing all the dogs playing in the off-leash area at this time of day, too. So... a shuffle, yes... it was 3.35 km in just over 25 minutes, but I am not going to complain! It has been a couple of weeks since I ran at all so it was wonderful to just get out there. I remembered to make us a Drip Drop drink to split before we went out. This medical grade rehydration powder makes such a difference for me in how I recover but I do wish it didn't have so much sugar in it. Is that a necessary part of it's magic? I like the taste of this... not salty at all, and not fizzy either... but I cannot purchase it in Canada and DRIP DROP has cancelled their ambassador program in Canada so they won't be sending me any more of it. I have also not seen it in the stores when I travel to the U.S. so have not been able to purchase it on my own either. I am open to suggestions for another brand if you have one you particularly like. What is your post-run recovery routine? Just under 70 sounds perfect! I'll take some of that please! I haven't used Drip Drop, but I use Vega Hydrator for long runs. I've never heard of Drip Drop but use Ultimate Replenisher as my hydration of choice. Depending on my run and what I feel like, I use NUUN or Vega Hydrator to rehydrate. Both are sugar free and not overly sweet, though I do dilute the Vega a bit more than what they recommend. Well dang thats a bummer on the ambassadorship! I am a Nuun ambassador and I love the stuff! I do hope you find something you like! I've never heard of this drink! Depending on what I'm doing, I like NUUN for hydration (post run), but for the long run I love Tailwind Nutrition. It is better than any fuel I"ve ever tried. Even my rugby playing teen loves it. Oh, wow. Sounds like the weather is perfect for running, shuffling or anything else you might choose to do! Never heard of Drip Drop. I like Nuun or chocolate milk for post-run recovery. I've never heard of this brand, bummer that you can't find it anymore! I'm a Nuun fan and an ambassador and love it! That's a bummer that they're canceling the ambassadorship, and that you can't purchase it in Canada. I'm a traditional one when it comes to hydration - water and Powerade do the trick for me. Too bad that they're leaving Canada. Why don't we ever get loved!? I just finished up a pharmaceutical hydrator that one of my clients gave me. Both me and my bf loved it but we're out of it so we're also on the look out for something new. I'm a Nuun fan, and am also learning to like SOS. Neither has much sugar at all. Nice job getting out there. Yay for sleeping in on a Sunday!! I like Fluid Recovery drink after a run. I am a Skratch Labs girl. Light flavor and not much sugar. Plus it comes in great pouches like that too! I'm a peanut butter sandwich or gatorade kinda gal. The weather has been wonderful and we just got back from a great weekend in Boston. Love that fall is right around the corner. Nooo, they're cancelling their Canada program? Boo. I'm a Nuun girl and honestly haven't bothered to try anything else because...well, why fix something that ain't broken. SOS rehydrate! I believe it ships to Canada. It's a medical grade electrolyte drink as well. I'm in love! I don't use recovery drinks but I know a lot of people love Nuun. i've never used any product to recover/hydrate, but that seems neat. I haven't been able to sleep in in 2 weeks now and won't get a chance until NEXT weekend lol ughhh. 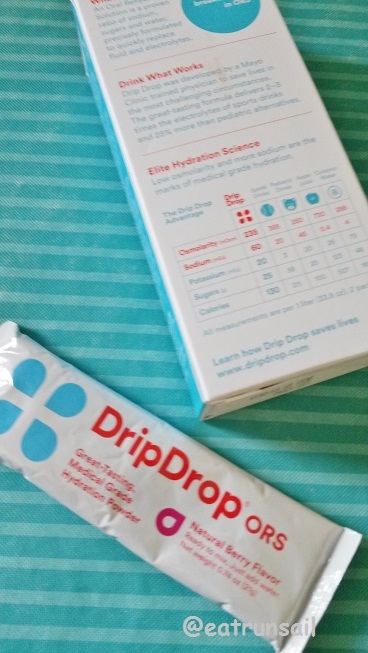 I've never heard of drip drop...for recovery I usually do a plantfusion protein shake.